Connecting with students, especially on modules with large student numbers, can be difficult. A Study Direct site can be used to develop relationships by sharing video and/or audio recordings by lecturers or tutors. Lecture recordings are a great learning resource but other forms of media can also be added. You might like to try recording short introductions to yourself, the module or specific concepts. These can be easily made using a range of recording and screencasting tools. A personal introduction to a module from the lecturer can be a great way to begin building relationships with students. 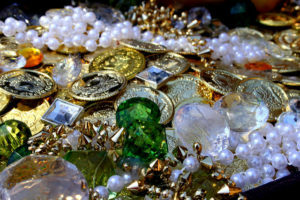 A collection of resources, however interesting, can easily seem just a list of links or files. To engage students with the materials it is important to make the context and relevance clear. For example, use ‘displayed content’ or ‘click-to-reveal content’ to add information about the resources and direct students to what is most relevant to them. This sort of contextualising also gives you, as the tutor, another opportunity to add your voice to the site as resources now appear as personal recommendations or suggestions rather than just a set of links. One of the main criticisms of VLEs such as Study Direct is that they are ‘walled gardens’ cut off from the dynamic online world outside. 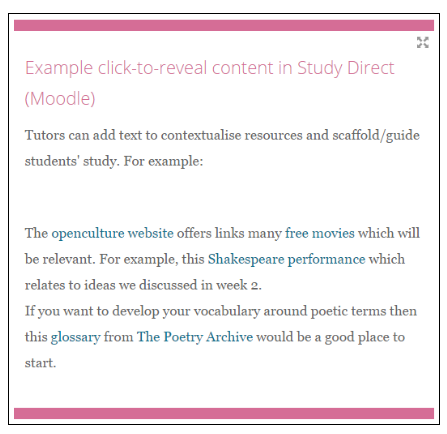 Of course there are very good reasons why a module site should be restricted to registered students (not least issues of copyright) but there are ways to bring the outside world into your site. This can encourage student engagement by highlighting real world applications for ideas discussed in a module. Adding an RSS feed from a website, blog or online publication can make your site more dynamic and engaging as the most recent content is fed automatically into a block. 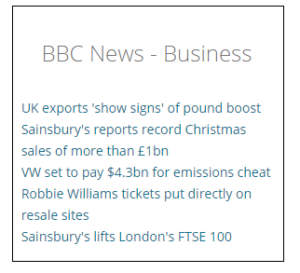 For example, a module in Business and Management could be enhanced by a feed from the BBC Business News showing the latest headlines. These are live links that students can click to read the full story. If you want to add an RSS feed to your Study Direct site you can find step-by-step instructions in this FAQ. Login to your Twitter account and go to ‘Settings’. Then select ‘Widgets’ and click on ‘Create New’. Enter the account or hashtag you want to use (@SussexTEL or #LTHEchat for example). You will get some display options and a link to ‘set customization options’. It is worth setting the customization to limit the size of the feed display. When you have chosen how you want your feed to appear, you will get a snippet of code to copy. Click on ‘Start HTML block’ and the HTML <> icon. Then paste the code from Twitter into the editor. Click ‘Save changes’ and your live Twitter feed will appear on your site. Not all resources need to come from the tutor of course. You might want students to contribute material that they have found interesting or useful and there are several ways to do that. The ‘Forum’ and ‘Database’ activities in Study Direct can be used, but there are also some more visually appealing options such as a Padlet wall (which can be embedded into your Study Direct site) or a collaborative Flipboard magazine (which can be embedded in an HTML block). Sussex University staff can learn about Rich Resources in Study Direct at a workshop on 9th February 2017 (11.30-12.30). Details and a link to booking are on the TEL workshops web page.